"Who will rid me of this meddlesome quarterback?" David, I actually had that line in the first draft, but it was cut and the--more awkward, in my opinion--line about assassination was put in. If I had seen the readback, I would have reinstated, because I didn't like seeing the term assassination in there. If you have to explain your metaphor, it ain't one. Just hope he does to Viking fans what he did to us Jets fans. 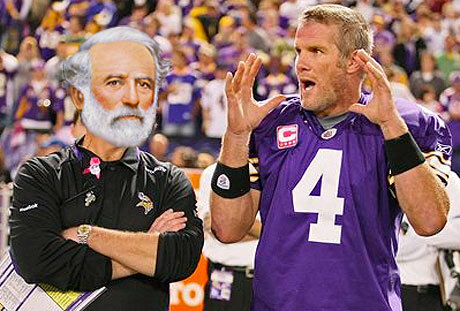 Boo or cheer when Favre takes the field? Glad to see you distance yourself from the word assassination, an unfortunate choice of words on the part of the editor. Your original choice was much better and more humorous.I love sports rivalries, they make the games and the fan experience more fun. Football is not war, it is a sport, it is not even close. I was literally under the knife (two hours) when it was going to press, so at least I had a good excuse.